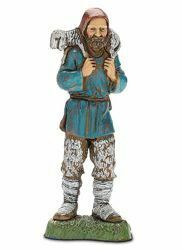 With its 180 statues and figurines, the handcrafted cheap plastic PVC Landi Moranduzzo small Nativity Scene cm 10 (3,9 inch) with 18th century traditional Neapolitan period costumes represents a collection of great beauty for Christmas indoor decorations. 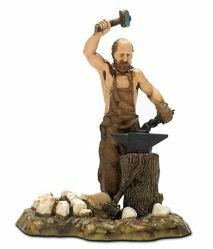 The small nativity scene’s rustic characters from Naples, the artistic backgrounds, the animals and various accessories and ornaments are original pieces created by the italian sculptor Martino Landi, descendant of a family of artists who carved statuettes for Nativity Scenes and Sets for four generations. 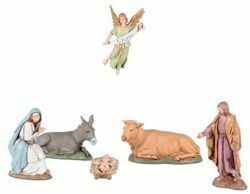 Each Nativity figure is made of plastic PVC and is screen-printed and finished by hand. 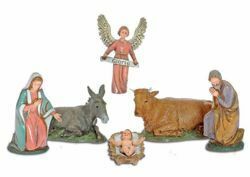 Complete collectible Neapolitan Nativity Scene figurines vintage style in plastic economic for home interior decor, with excellent quality/price ratio. 100% Made in Italy. 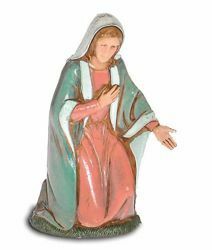 Mary / Madonna - Silk-screened and hand finished plastic (PVC) figurine for Landi Moranduzzo Nativity Scene with 18th century Neapolitan period costumes. 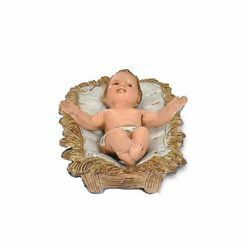 Baby Jesus - Silk-screened and hand finished plastic (PVC) figurine for Landi Moranduzzo Nativity Scene with 18th century Neapolitan period costumes. 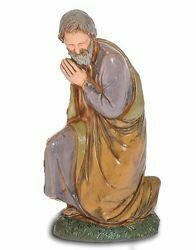 Saint Joseph - Silk-screened and hand finished plastic (PVC) figurine for Landi Moranduzzo Nativity Scene with 18th century Neapolitan period costumes. 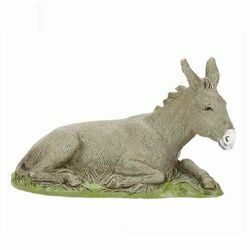 Donkey - Silk-screened and hand finished plastic (PVC) figurine for Landi Moranduzzo Nativity Scene with 18th century Neapolitan period costumes. 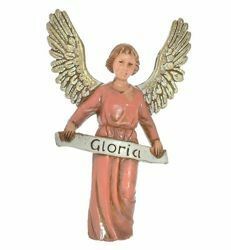 Glory Angel - Silk-screened and hand finished plastic (PVC) figurine for Landi Moranduzzo Nativity Scene with 18th century Neapolitan period costumes. 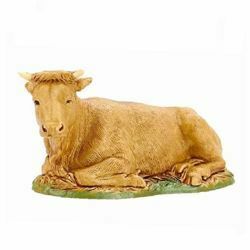 Ox - Silk-screened and hand finished plastic (PVC) figurine for Landi Moranduzzo Nativity Scene with 18th century Neapolitan period costumes. 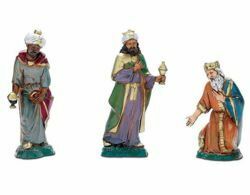 Wise Kings - Silk-screened and hand finished plastic (PVC) figurine for Landi Moranduzzo Nativity Scene with 18th century Neapolitan period costumes. Holy Family Set 6 pieces - Silk-screened and hand finished plastic (PVC) figurine for Landi Moranduzzo Nativity Scene with 18th century Neapolitan period costumes. 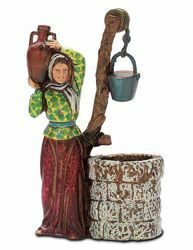 Arab Lookout - Silk-screened and hand finished plastic (PVC) figurine for Landi Moranduzzo Nativity Scene with 18th century Neapolitan period costumes. 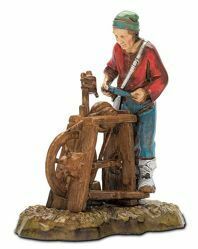 Knife Sharpener - Silk-screened and hand finished plastic (PVC) figurine for Landi Moranduzzo Nativity Scene with 18th century Neapolitan period costumes. 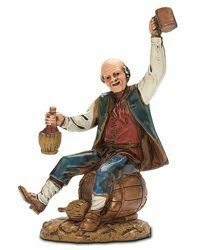 Drinker - Silk-screened and hand finished plastic (PVC) figurine for Landi Moranduzzo Nativity Scene with 18th century Neapolitan period costumes. 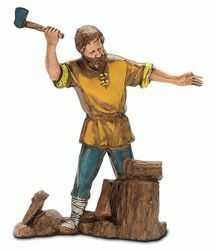 Lumberjack - Silk-screened and hand finished plastic (PVC) figurine for Landi Moranduzzo Nativity Scene with 18th century Neapolitan period costumes. 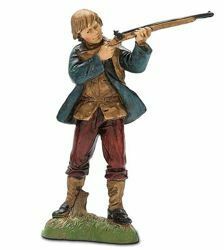 Hunter - Silk-screened and hand finished plastic (PVC) figurine for Landi Moranduzzo Nativity Scene with 18th century Neapolitan period costumes. 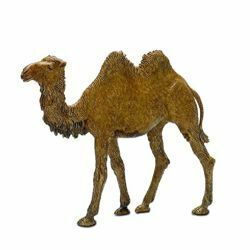 Standing Camel - Silk-screened and hand finished plastic (PVC) figurine for Landi Moranduzzo Nativity Scene in Arabic or Neapolitan style. 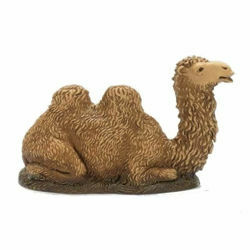 Kneeling Camel - Silk-screened and hand finished plastic (PVC) figurine for Landi Moranduzzo Nativity Scene in Arabic or Neapolitan style. 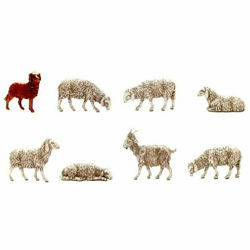 Goat, Dog and 6 Sheep - Silk-screened and hand finished plastic (PVC) figurine for Landi Moranduzzo Nativity Scene in Arabic or Neapolitan style. 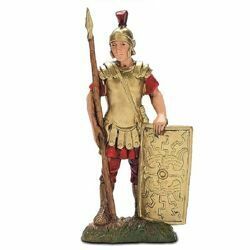 Centurion with Buckler - Silk-screened and hand finished plastic (PVC) figurine for Landi Moranduzzo Nativity Scene with 18th century Neapolitan period costumes. 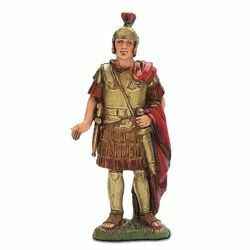 Centurion with Sword - Silk-screened and hand finished plastic (PVC) figurine for Landi Moranduzzo Nativity Scene with 18th century Neapolitan period costumes. 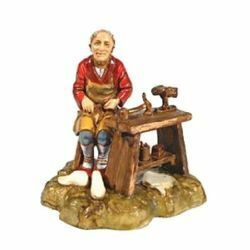 Cobbler - Silk-screened and hand finished plastic (PVC) figurine for Landi Moranduzzo Nativity Scene with 18th century Neapolitan period costumes. 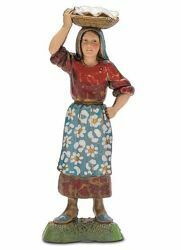 Woman at the Well - Silk-screened and hand finished plastic (PVC) figurine for Landi Moranduzzo Nativity Scene with 18th century Neapolitan period costumes. 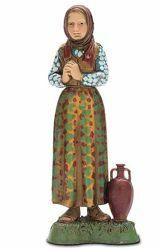 Woman with Amphora - Silk-screened and hand finished plastic (PVC) figurine for Landi Moranduzzo Nativity Scene with 18th century Neapolitan period costumes. 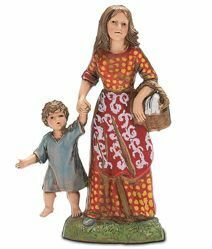 Woman with Boy and Basket - Silk-screened and hand finished plastic (PVC) figurine for Landi Moranduzzo Nativity Scene with 18th century Neapolitan period costumes. 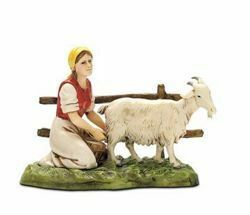 Woman with Goat - Silk-screened and hand finished plastic (PVC) figurine for Landi Moranduzzo Nativity Scene with 18th century Neapolitan period costumes. 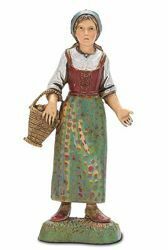 Woman with Basket - Silk-screened and hand finished plastic (PVC) figurine for Landi Moranduzzo Nativity Scene with 18th century Neapolitan period costumes. 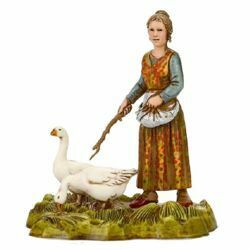 Woman with Goose - Silk-screened and hand finished plastic (PVC) figurine for Landi Moranduzzo Nativity Scene with 18th century Neapolitan period costumes. 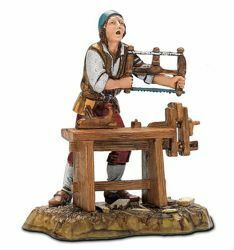 Blacksmith - Silk-screened and hand finished plastic (PVC) figurine for Landi Moranduzzo Nativity Scene with 18th century Neapolitan period costumes. 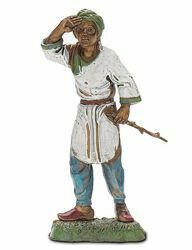 Carpenter - Silk-screened and hand finished plastic (PVC) figurine for Landi Moranduzzo Nativity Scene with 18th century Neapolitan period costumes.